I can’t recall any single year in my history in this business– pro video, AV Digital Signage– that saw so many technology introductions. Video projection, LCD flat panel displays, and LED. We can stop the list right there– and there is just a ton of product evolution this year. No it’s not a real Ford Mustang. 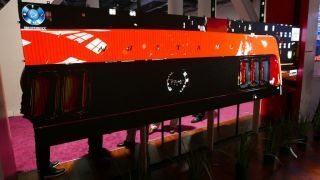 It’s the 1.2mm pixel pitch high res LED from LeyardThe entire projection world is in total flux, as the march toward lampless hybrid (generally the term used for lower-lumen LED/laser hybrid light source projectors in the 2-4K lumen range) at the low end is strong, and with the new laser phosphor projectors (also sometimes called blue pump laser) filling in previous gaps in the mid-range (4-12K lumen). Laser phosphor is the hottest category of projection now, not just for the obvious TCO issues (think 20,000 hour life for a laser-hybrid illumination source) but also for image quality.